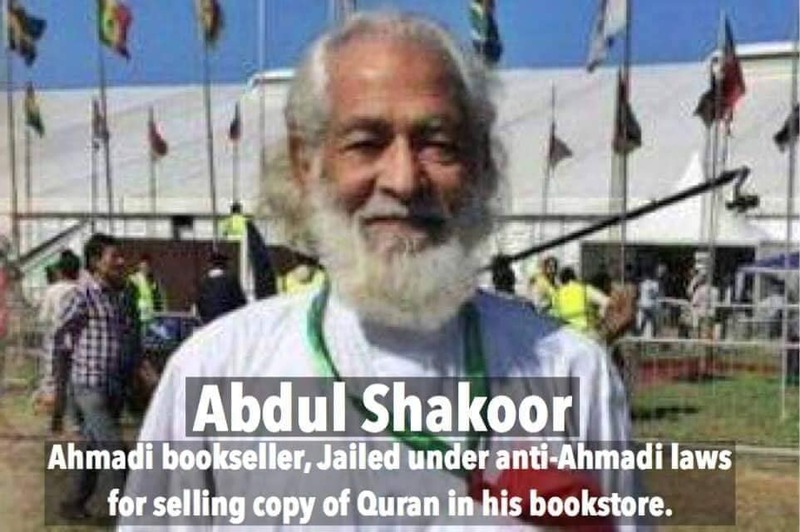 Abdul Shakoor, an elderly Ahmadiyya Muslim bookseller, has been freed from prison recently under strict anti-Ahmadi laws for selling copy of Holy Quran in his bookstore in Pakistan. Shakoor, is a free man after spending over three years in jail as a ‘prisoner of conscience’ by Amnesty International. Ahmadi Muslims are often jailed for their faith in Pakistan, often accused for blasphemy. This is a positive step and the authorities who worked to make this possible must be applauded. We must continue to strive to make Pakistan a nation where no one has to endure such miseries on grounds of their religious profession. It is a day of victory for those who believe in freedom of religion and universal freedom of conscience. It is a day of victory for those who cherish a peaceful and progressive Pakistan. May this be the foundation for much more progress in the way of human rights. On 26 April 1984, Ahmadis in Pakistan cannot mention Muslim in national IDs, passport or bank accounts. Let’s hope for the best, that one day the draconian anti-Ahmadi laws will be repealed in Pakistan.